Watch Creating the Future of Health Care to discover how Baylor Scott & White has transformed to be the new model of care as well as a national leader in health care. Healthcare is changing, and at Baylor Scott & White, we are changing it for the better. We believe care goes beyond hospital walls. With our new model of care, we treat patients when they’re sick, but we also work hard to keep them healthy. 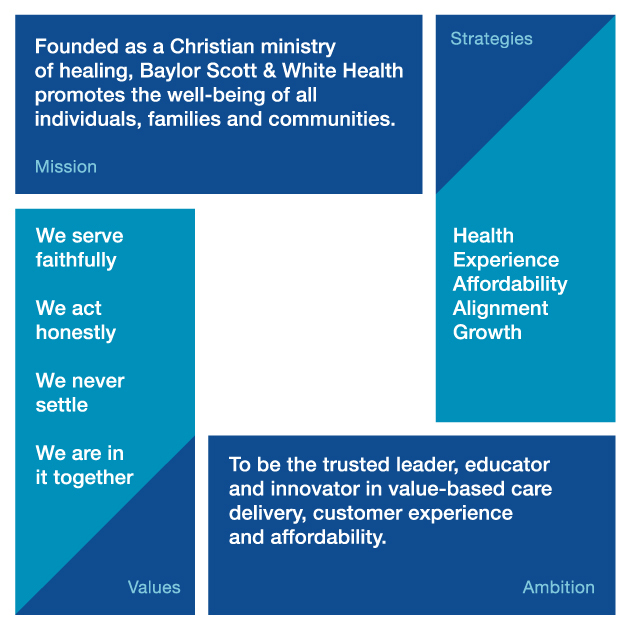 Our business is healing, and we have positioned ourselves as not only a provider of quality health care but also as a business that truly cares about people. We're proud of the national and local recognitions we receive because of the confidence you can find in working with an award-winning health system. Medical education – which includes internship, residency, fellowship and nurse education programs – is a vital part of our commitment to exemplary care. Here, you’ll learn the difference between being a health care provider and being one who truly serves others. You’ll have more than just a job. At Baylor Scott & White, you’ll find your calling.